The DPLC is a PLC I made for my final exams at high school. It can be programmed in a simple language, has 16 inputs and 16 outputs. It can be programed with 65536 bytes, which is equal to 8192 instruction (yes, 8 byte instructions). It’s designed as a piggyback module, which the user will put on the hardware he requires or choose from some standard HW. The core is a ATMEGA128 processor. The memory is a 24FC512. The program for the PLC is stored here. I made custom everything, cause I learned only recently that there’s a customisable assembler and stuff. 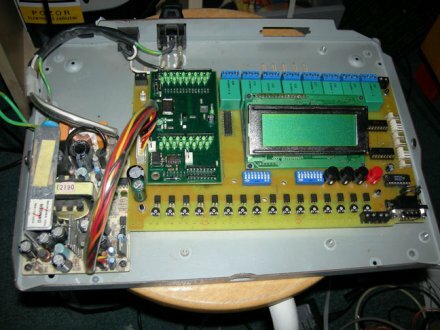 This entry was posted in Projects, Simple MCU stuff and tagged avr. Bookmark the permalink.